Southampton, UK, 9th April 2019 – Kongsberg Maritime will unveil the world’s most complete Ocean Ecosystem assessment tool at Ocean Business in Southampton today (stand N1). The company behind the game-changing Simrad EK80 scientific echo sounder has developed an innovative, holistic new platform which provides cost-effective data collection for improved understanding of the oceans and the effects of global warming and ocean acidification. 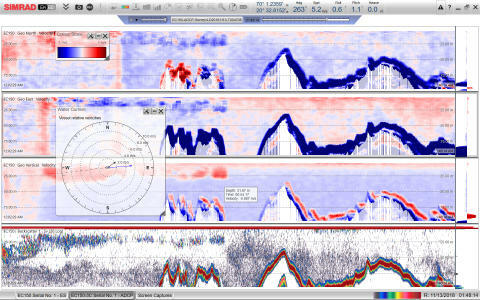 The ADCP option for the Simrad EK80 couples a new, state-of-the-art Wideband combined ADCP and Split beam transducer with the world’s most advanced and extensively used scientific echo sounder. The pairing results in the only system for research vessels that is both capable of quantifying biology with in-situ calibrated measurements and measuring ocean currents in high resolution, all in the same instrument. The inclusion of the ADCP in the EK80 system enables researchers to also measure current speed and direction as a function of depth in order to determine how organisms, nutrients, and other biological and chemical constituents, as well as heat are transported throughout the oceans. The deeper understanding of ocean ecosystems will contribute to improved models and various forecasts, informing national and international environmental policies. KONGSBERG’s new combi-transducer features four high-performance ADCP beams and an additional calibrated, wideband, narrow split beam echosounder for high-resolution, single target detection and characterisation. The phased array design with electronics also integrated in the transducer housing and a single operator station for both ocean current and biomass measurements, allows EK80 installations and upgrades to be carried out quickly and easily. 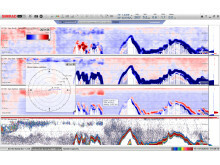 As the most flexible and accurate scientific echo sounder available, with operation on a large frequency band ranging from 10 to 500 kHz, the Simrad EK80 has become the de facto standard for Ocean Ecosystem and fish stock assessment. Now with the option to add the new combi-transducer and integrate control with the EK80 software, it introduces valuable new functionality, while also addressing the interference between ADCP and echo sounder beams witnessed in standard two-system configurations. While ocean science and fisheries research are the primary applications for KONGSBERG’s new integrated Ocean Ecosystem assessment solution, the combination of ADCP and EK80 is suitable for freshwater studies including river discharge water and sediment measurements. The system is also able to collect hydrology data that accurately describe the physical and biological attributes of fresh water systems for use in environmental and resource assessments and management.